This tutorial is aimed at NumPy users who have no experience with Cython at all. If you have some knowledge of Cython you may want to skip to the ‘’Efficient indexing’’ section. The main scenario considered is NumPy end-use rather than NumPy/SciPy development. The reason is that Cython is not (yet) able to support functions that are generic with respect to the number of dimensions in a high-level fashion. This restriction is much more severe for SciPy development than more specific, “end-user” functions. See the last section for more information on this. 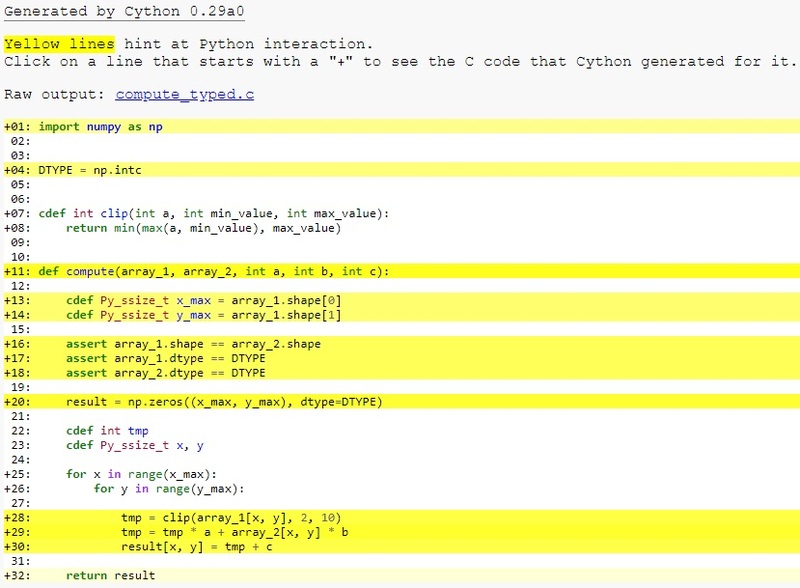 Kurt Smith’s video tutorial of Cython at SciPy 2015. The slides and notebooks of this talk are on github. Basic Cython documentation (see Cython front page). Cython is a compiler which compiles Python-like code files to C code. Still, ‘’Cython is not a Python to C translator’‘. That is, it doesn’t take your full program and “turns it into C” – rather, the result makes full use of the Python runtime environment. A way of looking at it may be that your code is still Python in that it runs within the Python runtime environment, but rather than compiling to interpreted Python bytecode one compiles to native machine code (but with the addition of extra syntax for easy embedding of faster C-like code). Speed. How much depends very much on the program involved though. Typical Python numerical programs would tend to gain very little as most time is spent in lower-level C that is used in a high-level fashion. However for-loop-style programs can gain many orders of magnitude, when typing information is added (and is so made possible as a realistic alternative). Easy calling into C code. One of Cython’s purposes is to allow easy wrapping of C libraries. When writing code in Cython you can call into C code as easily as into Python code. Very few Python constructs are not yet supported, though making Cython compile all Python code is a stated goal, you can see the differences with Python in limitations. The SAGE mathematics software system provides excellent support for using Cython and NumPy from an interactive command line or through a notebook interface (like Maple/Mathematica). See this documentation. Cython can be used as an extension within a Jupyter notebook, making it easy to compile and use Cython code with just a %%cython at the top of a cell. For more information see Using the Jupyter Notebook. A version of pyximport is shipped with Cython, so that you can import pyx-files dynamically into Python and have them compiled automatically (See Compiling with pyximport). Cython supports distutils so that you can very easily create build scripts which automate the process, this is the preferred method for Cython implemented libraries and packages. See Basic setup.py. If using another interactive command line environment than SAGE, like IPython or Python itself, it is important that you restart the process when you recompile the module. It is not enough to issue an “import” statement again. otherwise, see the installation page. This will install the newest Cython into SAGE. This creates yourmod.c which is the C source for a Python extension module. A useful additional switch is -a which will generate a document yourmod.html) that shows which Cython code translates to which C code line by line. This creates yourmod.so in the same directory, which is importable by Python by using a normal import yourmod statement. You can easily execute the code of this tutorial by downloading the Jupyter notebook. We’ll say that array_1 and array_2 are 2D NumPy arrays of integer type and a, b and c are three Python integers. This function uses NumPy and is already really fast, so it might be a bit overkill to do it again with Cython. This is for demonstration purposes. Nonetheless, we will show that we achieve a better speed and memory efficiency than NumPy at the cost of more verbosity. This code computes the function with the loops over the two dimensions being unrolled. It is both valid Python and valid Cython code. I’ll refer to it as both compute_py.py for the Python version and compute_cy.pyx for the Cython version – Cython uses .pyx as its file suffix (but it can also compile .py files). array_1 and array_2 are 2D. This should be compiled to produce compute_cy.so for Linux systems (on Windows systems, this will be a .pyd file). We run a Python session to test both the Python version (imported from .py-file) and the compiled Cython module. There’s not such a huge difference yet; because the C code still does exactly what the Python interpreter does (meaning, for instance, that a new object is allocated for each number used). You can look at the Python interaction and the generated C code by using -a when calling Cython from the command line, %%cython -a when using a Jupyter Notebook, or by using cythonize('compute_cy.pyx', annotate=True) when using a setup.py. Look at the generated html file and see what is needed for even the simplest statements. You get the point quickly. We need to give Cython more information; we need to add types. To add types we use custom Cython syntax, so we are now breaking Python source compatibility. Here’s compute_typed.pyx. Read the comments! # cdef means here that this function is a plain C function (so faster). # To get all the benefits, we type the arguments and the return value. # stored in the array, so we use int because it correspond to np.intc. # Py_ssize_t is the proper C type for Python array indices. At this point, have a look at the generated C code for compute_cy.pyx and compute_typed.pyx. Click on the lines to expand them and see corresponding C.
Especially have a look at the for-loops: In compute_cy.c, these are ~20 lines of C code to set up while in compute_typed.c a normal C for loop is used. So adding types does make the code faster, but nowhere near the speed of NumPy? So what made those line so much slower than in the pure Python version? array_1 and array_2 are still NumPy arrays, so Python objects, and expect Python integers as indexes. Here we pass C int values. So every time Cython reaches this line, it has to convert all the C integers to Python int objects. Since this line is called very often, it outweighs the speed benefits of the pure C loops that were created from the range() earlier. Furthermore, tmp * a + array_2[x, y] * b returns a Python integer and tmp is a C integer, so Cython has to do type conversions again. In the end those types conversions add up. And made our computation really slow. But this problem can be solved easily by using memoryviews. There are still two bottlenecks that degrade the performance, and that is the array lookups and assignments, as well as C/Python types conversion. The -operator still uses full Python operations – what we would like to do instead is to access the data buffer directly at C speed. What we need to do then is to type the contents of the ndarray objects. We do this with a memoryview. There is a page in the Cython documentation dedicated to it. In short, memoryviews are C structures that can hold a pointer to the data of a NumPy array and all the necessary buffer metadata to provide efficient and safe access: dimensions, strides, item size, item type information, etc… They also support slices, so they work even if the NumPy array isn’t contiguous in memory. They can be indexed by C integers, thus allowing fast access to the NumPy array data. ...                      # You get the idea. No data is copied from the NumPy array to the memoryview in our example. As the name implies, it is only a “view” of the memory. So we can use the view result_view for efficient indexing and at the end return the real NumPy array result that holds the data that we operated on. # to compare it simply by using == without a for-loop. # we convert them both to Python tuples. Let’s see how much faster accessing is now. Note the importance of this change. We’re now 3081 times faster than an interpreted version of Python and 4.5 times faster than NumPy. Memoryviews can be used with slices too, or even with Python arrays. Check out the memoryview page to see what they can do for you. Negative indices are checked for and handled correctly. The code above is explicitly coded so that it doesn’t use negative indices, and it (hopefully) always access within bounds. @cython.wraparound(False)   # Deactivate negative indexing. We’re faster than the NumPy version (6.2x). NumPy is really well written, but does not performs operation lazily, resulting in a lot of intermediate copy operations in memory. Our version is very memory efficient and cache friendly because we can execute the operations in a single run over the data. Speed comes with some cost. Especially it can be dangerous to set typed objects (like array_1, array_2 and result_view in our sample code) to None. Setting such objects to None is entirely legal, but all you can do with them is check whether they are None. All other use (attribute lookup or indexing) can potentially segfault or corrupt data (rather than raising exceptions as they would in Python). For extra speed gains, if you know that the NumPy arrays you are providing are contiguous in memory, you can declare the memoryview as contiguous. If all this makes no sense to you, you can skip this part, declaring arrays as contiguous constrains the usage of your functions as it rejects array slices as input. If you still want to understand what contiguous arrays are all about, you can see this answer on StackOverflow. We’re now around nine times faster than the NumPy version, and 6300 times faster than the pure Python version! Declaring types can make your code quite verbose. If you don’t mind Cython inferring the C types of your variables, you can use the infer_types=True compiler directive at the top of the file. It will save you quite a bit of typing. Note that since type declarations must happen at the top indentation level, Cython won’t infer the type of variables declared for the first time in other indentation levels. It would change too much the meaning of our code. This is why, we must still declare manually the type of the tmp, x and y variable. And actually, manually giving the type of the tmp variable will be useful when using fused types. Lo and behold, the speed has not changed. All those speed gains are nice, but adding types constrains our code. At the moment, it would mean that our function can only work with NumPy arrays with the np.intc type. Is it possible to make our code work for multiple NumPy data types? Yes, with the help of a new feature called fused types. You can learn more about it at this section of the documentation. It is similar to C++ ‘s templates. It generates multiple function declarations at compile time, and then chooses the right one at run-time based on the types of the arguments provided. By comparing types in if-conditions, it is also possible to execute entirely different code paths depending on the specific data type. In our example, since we don’t have access anymore to the NumPy’s dtype of our input arrays, we use those if-else statements to know what NumPy data type we should use for our output array. In this case, our function now works for ints, doubles and floats. More versions of the function are created at compile time. So it makes sense that the speed doesn’t change for executing this function with integers as before. The GIL must be released (see Releasing the GIL), so this is why we declare our clip() function nogil. # We use prange here. We’re now 7558 times faster than the pure Python version and 11.1 times faster than NumPy! If you want to learn how to make use of BLAS or LAPACK with Cython, you can watch the presentation of Ian Henriksen at SciPy 2015. If you want to learn how to use Pythran as backend in Cython, you can see how in Pythran as a NumPy backend. Note that using Pythran only works with the old buffer syntax and not yet with memoryviews.